The Grand App Writing Challenge Submissions! Before the week kicked off, I offered a fun little challenge called The Grand App Writing Challenge. With a week of rocking content ahead designed to help build a fun and thriving community who like to write apps that scratch their itches, I put forward the challenge for you good people to write some apps and see how far you get this week, and I will blog your progress at the end of the week. Well, while we still have a few sessions yet to go, it is Friday and I was keen to show off some progress! With which, I present the wonderful submissions from some of our attendees this week! My program is called HardwareMap. 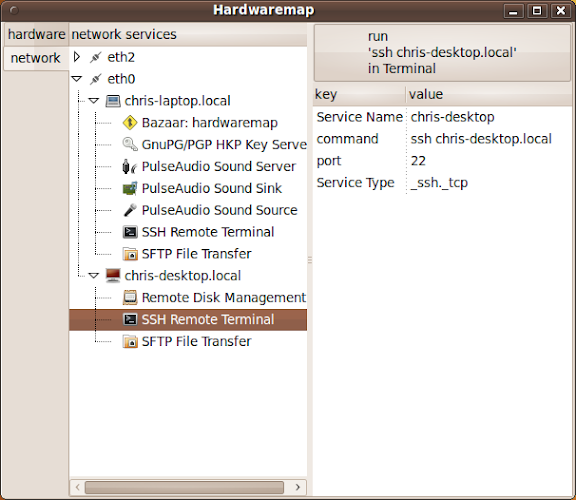 It lists computers and services on the local network (Avahi) and hardware connected to your computer (HAL). When you click a device, it tells you properties of the device and lets you perform common actions for that device. For example, an ftp share has a button to open in Nautilus, a webcam has a button to open in Cheese and an inline preview of the webcam. I created a python program called Blogite. It is suppose to be similar to Gwibber but for RSS feeds. It pulls in the RSS feeds, but I need a better way of displaying the feeds. I want to add categories so rss feeds can be easily separated and shown. It is still slightly rough around the edges. I also want to add pictures so it can show the picture right next to the post similar to Gwibber. Fantastic! This looks like it has bags of potential! 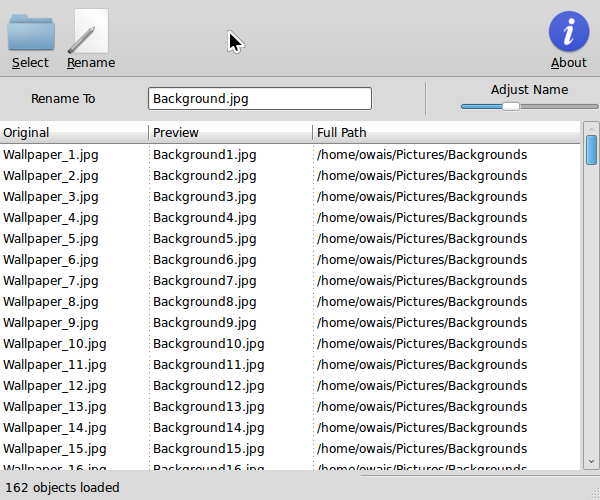 A simple Batch Renamer; That’s it. Even having a screenshot of my app on [email protected] would be something I’ll cheer about for a couple of months at least. Owais made great progress this week, so check out the project! Great work, Martin! It looks like you made fantastic progress! Uninstaller for Adobe AIR is an easy solution for uninstalling Adobe AIR applications. When installing an AIR application it is possible to first save the installation program file (. air). This file will then allow to install but also to uninstall the application, provided that the AIR engine is installed and functional. If you install an AIR application from its source without saving its installation program file, or if the AIR engine is not available, uninstalling an AIR application can be difficult on a GNU/Linux system because it requires the use of system commands via a shell. Thanks to Uninstaller for Adobe AIR it becomes very easy to uninstall an AIR application since it suffices to choose it from a list of installed applications and click on an Uninstall button. Uninstaller for Adobe AIR is a free software under GPL version 3 license, designed to compatible with the GNU/Linux Ubuntu distribution and with the GNOME and KDE window managers. I’m an (opportunistic 🙂 ) student developer, and wanted a better way to collaborate on bugs and watch issues on some of my favorite projects. 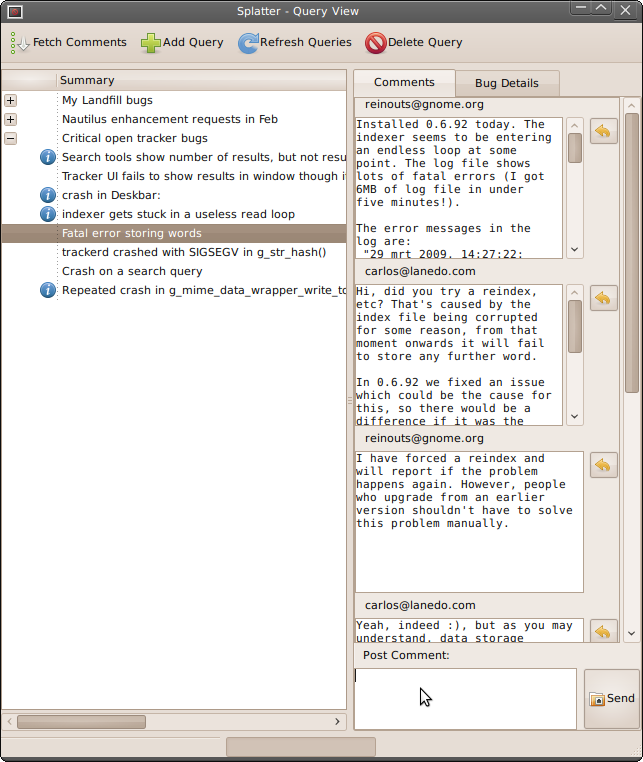 However I hated having to go through bugzilla’s overwhelmingly complex interface just to check up for new comments and changes. If I turned on email notification I’d be hit with a barrage of emails which I’m not too fond of. I felt it was time for things to change. So over the past one and a half weeks, I wrote Splatter – a gnome app to keep track of bugs. It evolved from a very simple concept of being a frontend to a bugtracker to becoming a tool for collaboration on tasks with fellow developers. For those of us currently deluged with work, stretching from one week to another, or simply those who work on many different things, tracking down when an event is happening in nigh impossible. Not just that, sometimes goals will simply get buried under a mass of other projects. It just ain’t easy to keep up with all of it. Some things aren’t fit for a calendar, while others just don’t work well with to-do lists. Finally sometimes you have to associate text or documents with an event, how are you going to do that? That’s where Ain’t Easy comes in. Straight from Alabama, this application will take as many goals or projects as you can throw at it, throw your links and text at it, it’ll just save it and let you launch it a simple double-click of the mouse. I look forward to seeing more updates, Andrew! In my original blog post I offered to send three of the projects an Ubuntu t-shirt. I was going to pick three fave projects, but I think all the submissions are great, so I going to send you all a t-shirt. Thanks all for taking part! Looks like this has been really successful. Nice stuff, Jono! I really like the looks of Splatter. I’m disappointed I couldn’t make developer week. Sounds like it went well. Great work. Oh, like the new theme, although it needs to be cleaned up. Ubuntu is willing to make bold changes, and this I like. It is just what Linux needs. Competition in the world of OS’s are heating up, and Ubuntu needs to be there. I’m loving this like a Google summer of code or sourceforge top app list. More useful software to play with. Wow. Can’t wait to wear the Ubuntu Colors. @jono: Could you please send a couple of nice Ubuntu stickers/badges for laptop. I find the first application the most interesting. I think there sure is a need for an application that gives you an overview what you’ve got in your system. However, I think it will make poor Martin Pitt sad after he has spent so much time on https://wiki.ubuntu.com/Halsectomy. Because HAL is deprecated and there is an effor going on to make sure as less applications as possible depend on it. I’m not sure if UDisks and UDev offer what the author needs, he’ll probably have to combine different sources. I currently use the HAL DBus object. I can switch to anything that I can use from Python or DBus. I could not find any DBus objects for UDev or DeviceKit (looking with both D-Feet and apt-cache). I did find the package python-gudev. Python-gudev is only available on Lucid but I’ve got a request to package my program for Jaunty. very nice and beautifful color !!!!!!!!! With quickly I could develop an utility in 3 days. I have release with the name of “Vijockey”. It’s a video player custom utility. Maybe could be useful to others. I think it could be great to have a page with all of this “opportunistic software”. Maybe in the ubuntu wiki? That was a nice challenge to be part of . I really missed it. The whole opp. dev. week was fantastic. Thanks Jono and all who participated…. Lernid was very good as well, in terms of making it easy to join and putting all the content (or at minimum pointers to content) in one place. Very cool stuff. It is a UI bar for quickly with a terminal.